The Sanskrit word kapalabhati means “skull-shining.” I often begin my day with kapalabhati after using the neti pot. It leaves me feeling both mentally energized and calm–a very different feeling from the agitation that accompanies hyperventilation. And, in fact, despite appearances, kapalabhati isn’t hyperventilation, as long as it’s done properly. To practice kapalabhati, sit in a comfortable, upright posture such as virasana or a stable cross-legged seat. Contract your abdomen swiftly and vigorously, expelling your breath through your nose while keeping your spine fairly vertical (this means you’ll mainly use the transversus abdominis muscle, whose job is to compress the abdominal contents). Immediately following the contraction, relax your abdominal muscles to let your belly drop, which will allow air to flow back into your lungs. As you get comfortable, you can build up to a fairly rapid pace, but keep the emphasis on the exhalation. Don’t try to inhale actively. Simply allow the inhalations to happen between exhalations. Don’t practice kapalabhati if you’re pregnant. If you have an abdominal hernia or other abdominal condition, steer clear of it as well. Experienced practitioners can breathe as rapidly as two breaths per second during kapalabhati. That’s 10 times as fast as a typical quiet breathing rate of 12 breaths per minute. Intuitively, that seems like hyperventilation and that breathing that quickly would blow off significant amounts of CO2, but let’s look at it more closely. To estimate the volume of air moving through the lungs, we’ll calculate “minute ventilation,” the amount of air you inhale (or exhale) per minute. The “average” person takes in about half a liter (500 ml) of air per breath during normal quiet breathing. This is called “tidal volume.” Multiplying tidal volume by breathing rate gives us his minute ventilation, in this case 6 liters (500 ml x 12 breaths per minute). At 500 ml per breath and 120 breaths per minute you’d move 60 liters of air in and out every minute while practicing kapalabhati. That’s 10 times normal minute ventilation–appropriate if you’re exercising vigorously, but a lot if you’re sitting still. Your abdominal muscles get a workout during kapalabhati, so your ventilation has to increase somewhat, but probably nothing like 60 liters per minute. Why is tidal volume lower during kapalabhati? Kapalabhati is different because it’s a non-diaphragmatic breath. When you exhale during kapalabhati, the abdominal muscles contract. They push the abdominal contents upward against the diaphragm, actively compressing the lungs and driving air out. You inhale not by contracting the diaphragm, but by relaxing the abdominal muscles. This causes the abdomen to drop. As gravity pulls the belly down, it also pulls the diaphragm’s central tendon and the base of the lungs down, creating the expansion that brings air in. Because you’re breathing rapidly, your next exhalation begins before your diaphragm has a chance to descend very far. The central tendon probably doesn’t even drop to where it would be at the end of a normal exhalation, much less to where it would be after a normal diaphragmatic inhalation. Not only that, to allow the belly to move as freely as possible in kapalabhati, you need to stabilize the base of ribs. You can feel this when you practice kapalabhati by placing your hands on your lower ribs and noting how they don’t widen as they typically do when you breathe diaphragmatically. Because you’re missing the lateral expansion of the lungs that usually accompanies the downward pull on their base during a diaphragmatic inhale, tidal volume is reduced even further. Another factor also keeps kapalabhati from becoming hyperventilation: only part of that tidal volume is actually involved in gas exchange. 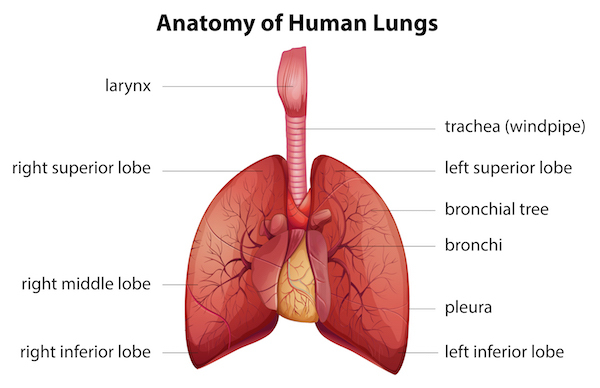 To understand why that is, we’ll look at the microscopic anatomy of the lungs. Gas exchange takes place at the interface between tiny, gossamer-walled air sacs known as alveoli, which make up the bulk of the lung tissue, and the networks of capillaries that surround them. Capillaries are so narrow that red blood cells pass through single file, like customers funneled through a supermarket check-out line, and so thin-walled that oxygen and carbon dioxide can diffuse between the alveoli and the blood. Since the air that fills the tubing isn’t involved in gas exchange, that volume is called the anatomical dead space. It’s usually estimated at 150 ml. Thus, of the 500 ml taken in during a typical quiet breath, only 350 ml actually reaches the alveoli. At 12 breaths per minute, normal “alveolar ventilation” is 4.2 liters (12 x 350 ml), not the 6 liters that pass through the nostrils. Before air reaches the alveoli it must pass through an extensive network of tubing, from the nose or mouth through the throat, the trachea, and a series of smaller and smaller branching tubes within the lungs. If the alveolar-capillary interface is the checkout line where the business of breathing is transacted—oxygen for carbon dioxide—the airway is like the network of highways and local streets that conduct goods to and from the market. Alveolar ventilation rather than total ventilation determines how much CO2 gets expelled, so we’ll need to estimate that for kapalabhati. Arbitrarily splitting the difference between the high and low figures mentioned above for tidal volume during kapalabhati, we get an average of about 250 ml. Subtracting 150 ml of dead space gives us an estimate of 100 ml of alveolar ventilation per breath. 120 breaths per minute would yield 12 liters per minute. That’s a rough guess, and the actual amounts could be very different for a particular individual, but it fits with laboratory observations. In the small number of studies on the subject, researchers have generally found that expired CO2 levels remain normal even during lengthy bouts of kapalabhati, at least for experienced practitioners. In addition, their cardiovascular parameters don’t reflect what you’d expect to see in hyperventilation. Whatever the increase in alveolar ventilation, it appears to match the body’s increased need for oxygen, and therefore production of CO2. That makes sense in light of the fact that most of the air moving in and out is simply filling and emptying the airway, without reaching the alveoli. This also yields some insight into why it’s important to practice kapalabhati correctly, and, in particular, to try not to inhale actively. Just let the inhalations happen as you relax the belly between exhalations. Otherwise, you could drive alveolar ventilation too high, turning it into a true hyperventilating breath. In my experience, this is typically why people feel lightheaded or dizzy during kapalabhati, and why some find it stressful—particularly those who are habitual paradoxical, or reverse, breathers. For them, because it’s difficult to relax the belly while inhaling, kapalabhati turns into a series of rapid forceful thoracic, or apical, breaths. That’s much more likely to lead to hyperventilation than the series of sharp abdominal exhales that kapalabhati is meant to be. In general, if you tend to be a chronic hyperventilator, are asthmatic or subject to panic attacks, I would suggest avoiding kapalabhati, for those reasons. Of course, it’s not easy to let go of trying to inhale. It requires trust that you will get enough air. But that might just be the most important reason to learn to do kapalabhati safely. Hi Joe, interesting read. So if we are merely moving air in and out the airway why do we do kapalbhati. And why do we feel calm after practicing kapalbhati? Whats the physiology behind it? Glad you liked it! There’s some alveolar ventilation with kapalabhati, just not a lot. I think there are several benefits of kapalabhati. One is activating the transversus abdominis, the “corset” ab muscle, in coordination with the exhalation. The transversus is important for spinal stabilization & maintaining intra-abdominal pressure. Equally important, kapalabhati trains us to relax the abdominals (on the inhalation) as well as to contract them. This is important because many people habitually over-contract the abs. Also, it can help clear out the nasal passages and is generally energizing. As to why we feel calm afterward, I don’t have a definitive answer to that. But there has been some research that supports the idea that although it’s a stimulating, sympathetic practice, it also can result in increased parasympathetic tone.